Bored of the same old sponge for your birthday cakes? Don’t worry. We’ve got plenty of ideas that make the most of seasonal goodies, from rhubarb bakewell to white chocolate profiteroles. Spring, fruit and vegetables are starting to emerge all around us. If you grow your own food, you’ll know that gooseberries and elder blossoms are some of the first sweet things to emerge in spring. Gather them in and make a spring jelly for spreading on birthday cakes instead of boring shop-bought strawberry jam. Alternatively, whip up a fresh-tasting lemon sponge and decorate it with crystallised flowers from the garden. Roses, violas, violets and rosemary flowers are all suitable for bringing in, to crystallise and scatter over your birthday cake. From early to late summer, there is a wide choice of seasonal fruit. It’s fresh, it’s local, and it’s cheap enough to pile plentifully on summer cakes! Summer birthday cakes needn’t be heavy creations: for an out-of-the ordinary birthday cake, bake a batch of profiteroles (using a basic choux pastry recipe) and cool on a wire rack. Then pipe vanilla cream into each one and arrange them in a big heap on a platter. Drizzle with melted white chocolate or raspberry coulis and then scatter with fresh berries for a fabulous party centrepiece! 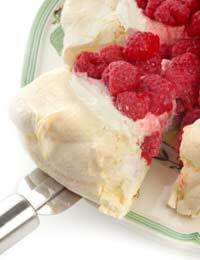 If you’ve a taste for the classic, why not make a summer pavlova topped with seasonal berries? The meringue base is easy to make ahead: just top with swirls of whipped cream and freshly washed and dried strawberries, raspberries, blueberries, or blackcurrants. Autumn is a good time to get into the kitchen and bake a cake. In season are autumn berries – blackberries, elderberries and rosehips – which make fantastic jams and jellies for spreading on cakes. There’s also an abundance of British nuts, many of which grow wild in the countryside: look out for hazels, walnuts, and sweet chestnuts. Toss the nuts into melted brown sugar and then pour the golden mass onto a baking tray to make shards of praline – stylish decorations for any birthday cakes. Match autumnal flavours of maple and cinnamon with seasonal nuts to create a delicious birthday cake. Top a brown-sugar sponge with maple syrup icing, and scatter with crushed, toasted hazelnuts. For something more traditional, bake a Victoria Sponge and fill it with homemade plum jam. Plums make great jam, as their natural pectin is sufficient to require limited lemon juice to set. Winter may seem like a brown season, but there’s plenty of green growth to supply us with seasonal goodies! Forced rhubarb is the earliest treat to appear – usually after Christmas – and it makes a beautiful filling for a stylish tart or sponge. At the same time, imported Clementines arrive in the shops, and though they’re not UK-grown, they are at their peak. For a winter birthday, bring in the season’s flavours by baking a chocolate cake with extra orange zest – for a sprightly alternative to the original. Or pot up some rhubarb jam and use it to fill a Bakewell tart, or even a Baked Alaska – they may be unusual birthday cakes, but we bet they’ll go down a storm! You’ll find more cake recipes, including Profiteroles and chocolate cake, on our sister site CakeBaker.co.uk.